I had a beautiful stay at the riverside. I met some lovely people and I slept very well. It’s a special place. And Enricos guide to the city was phenomenal. Thank you Enrico! Great atmosphere and very friendly owner! Brilliant! The host was so helpful and so kind he deffo made the whole trip a lot better, gave us a lot of suggestions of things to do around Berlin. We were made to feel at home in this small hostel, which was clean, comfy and roomy and each bed had their own privacy. Location was great to. Excellent Hostel with a great owner! Enrico has great recommendations for where to go and what to do in the neighborhood and city. It’s more similar to an Air B&B than larger hostels. There’s no 24-hour reception, so make sure you email Enrico after reserving on the website to confirm your reservation and coordinate your arrival. One of the best hostels in Berlin, not in the last place due to the co-owner of the place who manages it himself. 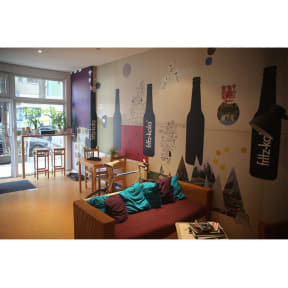 `Being very small hostel, the place either attracts the right crowd or brings the best from people staying there, but there is always a nice atmosphere there. My friend and I had a great stay at riverside lodge! Great location, clean facilities and Enrico was really helpful. Thank you!! Stayed here for our anniversary in November in a private room. Lovely location right by a local market, close to the underground and the gentleman in reception was super chatty and helpful. We loved it and can't wait to come back.